I’m a guy, and as a guy I love a good action flick. Nothing is better than getting a good taste of surrogate adrenaline without any threat of danger. Good or bad that’s just how it is. Chad Williams’ Seal of God was an adrenaline thrill ride I wasn’t expecting. 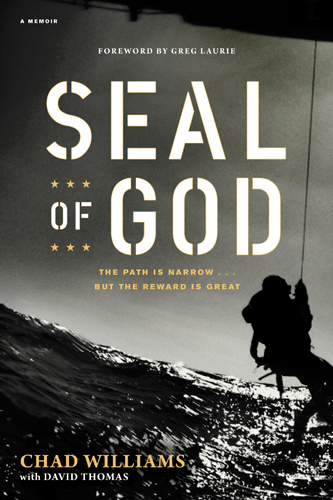 I’d say the first half of the book is about his life before Christ: a professional skater at fourteen, a sports fisher, a college failure, and then he gets the big idea to join the Navy and become a Navy Seal. He trains for months with a former Navy Seal, who is killed in Iraq working for a private contract company, which only further fuels his desire to be a Seal. The next quarter of the book relates in stark detail his training to be a Seal. He was one of only thirteen who made it out of 173 candidates. This is where the adrenaline sets in. I don’t know if it was Williams or his co-author Thomas who spun that story, but I was riveted. It felt like I went through Hell Week right along with him. I even considered going out and running 10 miles just like the trainees, but then realized I’d probably die if I did that. Then the book gets good. Williams gets saved at a revival meeting, and he’s ostracized by his Seal mates. No, ostracized isn’t the right word, he’s ridiculed, tortured . . . persecuted for the sake of the Gospel. I was stunned. These were Americans literally torturing a fell soldier because he didn’t want to go drinking with them anymore. Crazy! Williams starts preaching the Gospel everywhere he can from that point forward. Great stuff! I don’t want to give everything away. There’s a lot in there, including some bits from missions he’s involved in overseas, but this is an excellent read, and I highly recommend it. I received this book free from the publisher for review. All opinions are my own.